So much democracy, and so few Howard Roarks? The real beauty of our cities—and the ethereal beauty of their brains—is to be seen from above, and at night. In cities like New York, the view can be had for a few dollars from some sky-kissing tower in Manhattan. 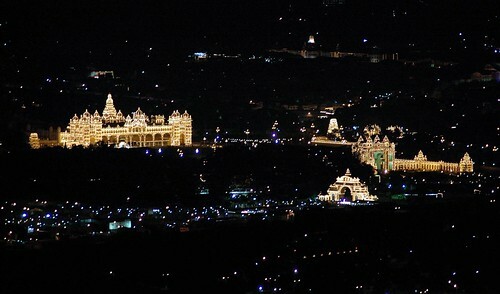 In cities like Mysore, the view can be had for free from the eternal, expansive Chamundi Hills. As the key milestones of the kingdom come aglow every Dasara to the oohs and aahs of tourists, you have to wonder, though: why have our modern maharajas, diwans and Rasputins—the politicians, the bureaucrats, the town planners, the builders, the developers, the real-estate brokers—failed to come up with a single structure that could stand the test of time? Why, in other words, is their/our urban vision constricted to “mini”-Vidhana Soudhas, “hi-tech” bus shelters, and obnoxious welcome arches? This entry was posted in Kannada & Karnataka, Mysore-Bangalore, Rajas & Maharajas and tagged Ayn Rand, Chamundi Hills, Churumuri, Dasara, Diwan of Mysore, Fountainhead, Howard Roarks, Karnataka Photo News, Mysore Dasara, Photography, Rasputin, Sans Serif. Bookmark the permalink. hmmm… that didn’t turn out well… I blame WordPress! The answer lies in the question that is asked. The government is not a monarchy. It is a representation of our own selves. The government or or people working for it cannot be expected to do such work. Their job and interests lie in building something that is functional. In fact, many of the structures that have stood the test of time have been created by private enterprise or out of personal interest. because ours is a socialist country, there is no place for objectivists/individualists like Roark. Ah, churumuri quotes Ayn Rand at last. BTW I was reading about an architect Mitchell Joachim in Wired magazine about his views on ‘redesigning cities from scratch’. What a fantastic photograph! I salute the photographer who took this amazing picture. I disagree with Beeba…Indians have the hustle, it is just that the each indian’s hustle contradicts the hustle of the indian next to him/her…so we have all in all a nullifying effect to all out drives!